During the 18th and 19th centuries the ships of the London based Hudson's Bay Company called annually at Stromness to recruit workers for their fur trading outposts in Canada, and to obtain fresh provisions for the voyage. By the end of the 18th Century almost three-quarters of the workforce were Orcadian. Whalers regularly called for fresh supplies, water and men, and many Orkneymen went to seek their fortune in the Norwast. 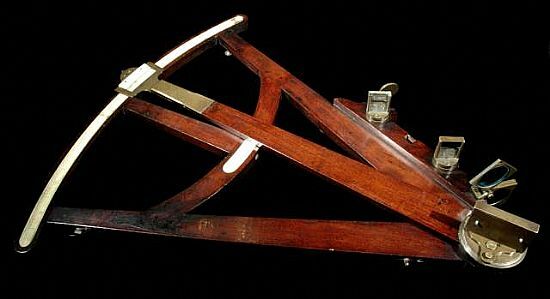 Octant used by John Rae on his Arctic voyages. Length 19 inches. Width 17 inches. 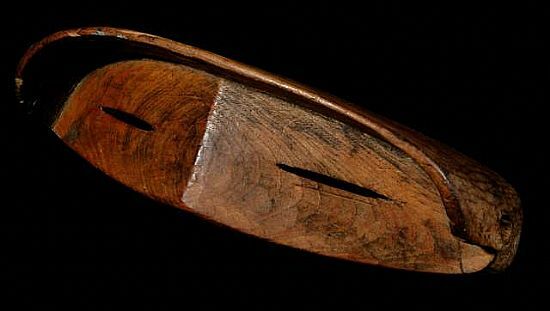 Model Inuit Kayak of wood, hide and bone. 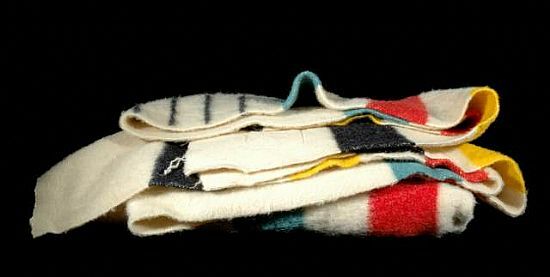 This toy, and the model sled below, were brought from Canada at the turn of the 19th century by the Will sisters, who lived with their aunt in Stronsay after the death of their Inuit mother. Approximate length 720mm, width 100mm. 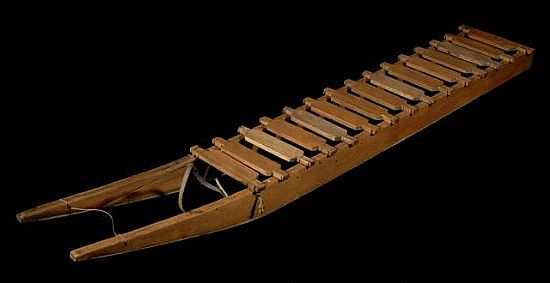 Model husky sled. made from wood, bone and cord. Also from the Will sisters - see above. Approximate length 500mm, width 80mm. 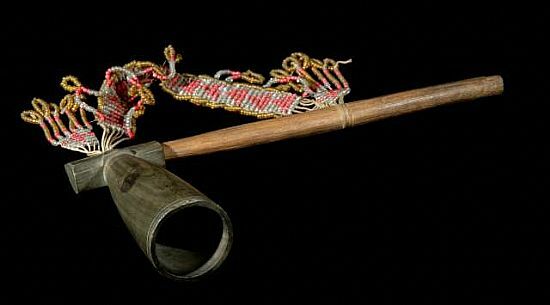 Single barreled smooth bore shotgun with percussion firing mechanism. It was made by E & W Bond, London and belonged to John Rae. The shotgun is featured in the statue of the reposed John Rae in Kirkwall's St Magnus Cathedral. Powder horn made from natural horn with a metal tip and top lid. Inscribed "L * D 19". 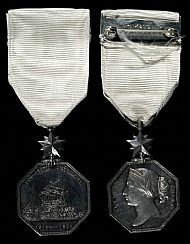 It was brought back from the Arctic by Dr John Rae as a relic from the Franklin expedition of 1845. A piece of chewing tobacco which has an original handwritten label reading "Relic of the Franklin Expedition purchased from Eskimos by members of one of the relief expeditions sent out to discover the fate of the lost Franklin Expedition". The card on which it sits describes it as being "from the days of sail". 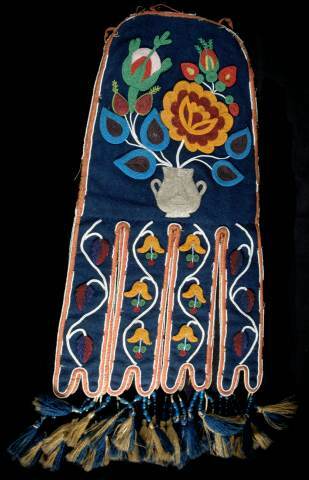 A Cree beadwork bag with eight 'legs'. 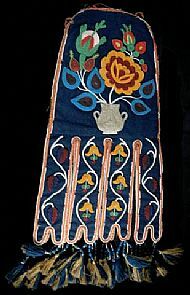 The design of flowers in a vase shows European influence, so perhaps it was made for a Hudson's Bay Company employee to bring or to send home. A pair of snowshoes strung with gut. Presented to the Museum in 1838. Oil on canvas, with an ornamental gilt frame. 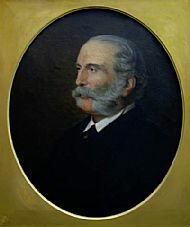 This portrait shows John Rae in old age, with grey hair and whiskers. Unsigned and undated, it was probably painted in London, and features on the front cover of The New Orkney Antiquarian Journal, Volume 7, produced by the Orkney Heritage Society. This volume is the collected papers of the John Rae 200 Conference run by Stromness Museum in 2013, and available to buy online from the Heritage Society's website. Arctic medal awarded posthumously to Thomas Work of Shapinsay. He died as a member of the crew of HMS Erebus on Sir John Franklin's 1845 expedition to trace the North West Passage. Carved wooden goggles with a narrow slit for the eyes and shaped to fit on the nose. Pipe - North American First Nations, bowl of stone, with wooden shank and beadwork attached. 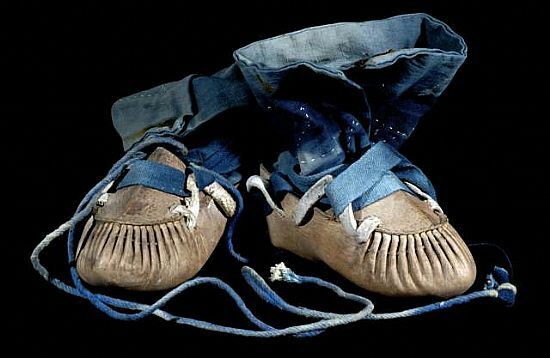 Small lady's moccasins with blue fabric tops and laces and animal hide bottoms. Length 200mm. This four string fiddle was used by John Rae in the arctic and given to his old friend, Willie Robertson of Orphir. Although John Rae was not known as a fiddler, there were certainly fiddlers with him on his expeditions. The fiddle became the topic of a book produced by this Society, more information is available by clicking on the image. This piece of scrimshaw is worked on the tooth of a sperm whale. On one side it shows a whale rising from the sea and knocking men out of their small boats, and a harpoon is flying. On the other side a fully rigged sailing ship is passing a polar bear on a piece of floating ice. 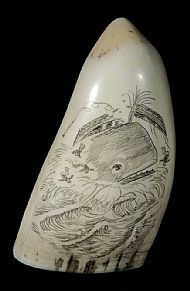 Scrimshaw is made by carving into the tooth and rubbing a mixture of chalk and ink into the lines. It was done as a pastime by many seafaring men. In the mid-19th century, the search was on for the elusive Northwest Passage, that area of water connecting the east side of the globe to the west, north over Canada and through the Arctic regions. Whichever country was successful in navigating this route would ultimately be able to control it, and therefore trade between East and West. Britain at this time had the best navy in the world, so it was not unusual to expect Britain to find this elusive stretch of water. Expedition after expedition set out, but it was ultimately the disappearance of Sir John Franklin’s ships that brought Rae to the forefront of Arctic exploration. Rae, born in Orkney in 1813, joined the Hudson Bay Company straight out of university initially as a surgeon, but he soon discovered his talent for navigating the Arctic tundra. He gained an enviable reputation throughout his lifetime of being a first class explorer, which led to him being chosen to head up the expedition to find the lost Franklin expedition and their two ships HMS Erebus and HMS Terror by the London Admiralty. However, when Rae reported his findings to London he was castigated by society, and eventually became the only Arctic explorer of his generation not to receive a knighthood. Why should this be? 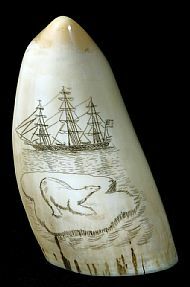 Because he reported that the local Inuit recounted having found items from the expedition, and that some members of the Franklin expedition had resorted to cannibalism. Unfortunately, modern expeditions have borne this out to be true, but Rae was never believed in his lifetime. The Halkett or cloth boat (to the right) was invented by Lt Peter Halkett RN, and despite being used by many explorers, John Rae among that number, it was not a commercial success. 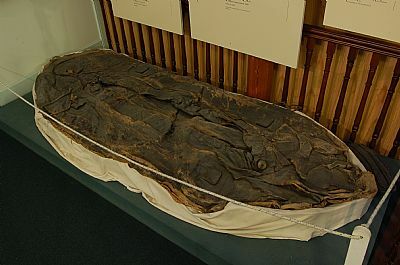 The boat in our collection is the only known example to have survived, and although it never made it to the Arctic, it did belong to Rae until given to a friend in Orkney. It was probably the additional boat requested by Rae for his final expedition in 1853, but was unused. It was made from layers of cotton fabric and rubber in the same style as that very modern Victorian invention, the Mackintosh waterproof coat, and was actually designed to double up as a cloak, the wearer carrying a walking stick (paddle) and large umbrella (sail). 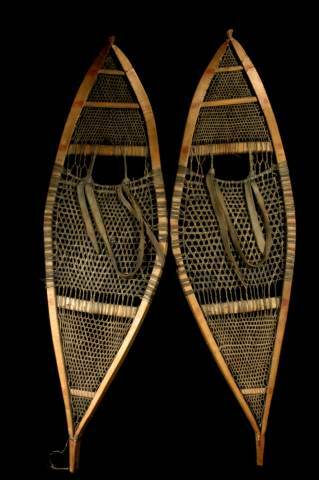 It seems unlikely that Rae would have carried these double-duty items, though we’re sure he would have been entertained by the thought of taking such items to the Arctic. The boat has copper alloy air valves and its canvas fender was filled with cork, and the one in our collection dates from around 1852. It could carry two men or a substantial load of stores, and took only four minutes to inflate. On its bow is painted ‘Dr Rae, Hudson Bay’ and on the stern ‘James Fitzjames,’ Fitzjames being commander of HMS Erebus on the lost Franklin expedition.